It smells so good here right now, like you have walked into a secret garden if you close your eyes when you walk outside. The trees and flowers are all in bloom in all of their beautiful Spring glory, and they are loving the warm weather we have been having. It may not seem like the time to be baking things, since you want to spend all of your time outside in the sun when the weather is like this, and you are not at work, but I figured I went outside for a 7 mile run in the morning, worked then went for a 3 mile walk in the afternoon, so why not relax and bake something afterwards? I was in the mood for something chocolate chip cookie dough like. Blondies sounded perfect! I hadn't made any in a really long time, and I am still looking for a perfect blondie recipe. Meaning one that tastes just as rich and delicious as traditional ones, and is healthier without tasting like it. One good way to make thing taste rich and delicious? Add nut butter to the recipe. And nut flour in this case. Raw Guru recently send me some raw almond butter and I had some of their raw almond meal, so I thought that they would be perfect in my little blondie recipe experiment. 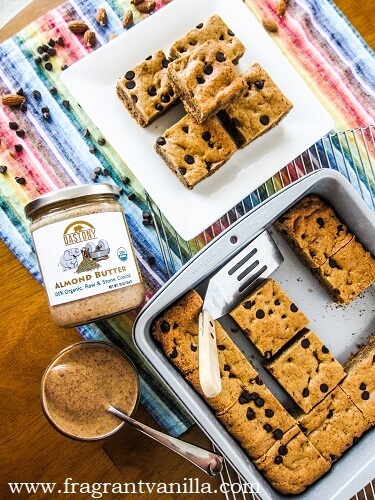 Their almond products are fabulous by the way, the almond butter is super smooth and has a sweet flavor, and their almond flour is the best I have tried. I should mention, if you do check out the Raw Guru Website, and you decide to order something, use my coupon code FRAGRANTVANILLA to get 10% off your order, typed in at your checkout. Back to the blondies, I was super excited about them. For the dough, I used my chocolate chip cookie recipe but tweaked it a bit. I always use flax eggs in my cookies, because I always have ground flax seed on hand, and they always work perfect. You would not even be able to tell there are not eggs in m cookies. 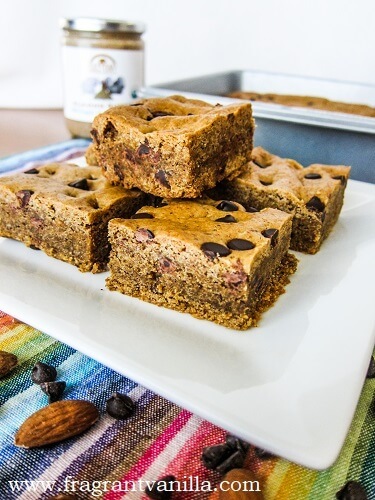 For the oil portion that I normally use in my cookie recipe, I swapped half with almond butter to make these nice and chewy, plus give them a delicious almond flavor. I swapped out 1 cup of the gluten free flour for almond meal and it was perfect! I used maple sugar in these to give them a sweet maple flavor, and let me tell you, the dough was amazing. Like the best chocolate chip cookie dough ever. I added in plenty of chocolate chips. Because that is how I like it. Someone recently complained that I put too many chocolate chips in my cookie recipes, but guess what? 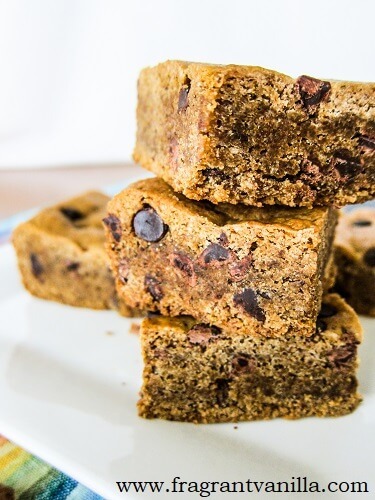 I need all of those chocolate chips in my cookies and bars and that is how they will always be on this blog. 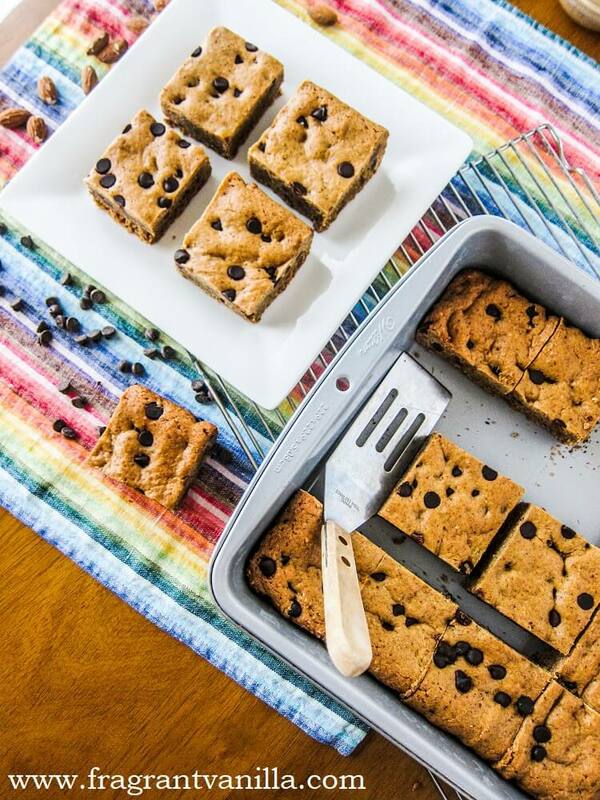 Because gooey chocolate chips are amazing! The more the better! They baked up beautifully, and my kitchen smelled so amazing for hours after! Unfortunately I had to wait for them to cool a bit (a bit more than I would like, because I wanted them to look nice in pictures for you all). But OMG were they ever amazing when I was finally able to dive in! 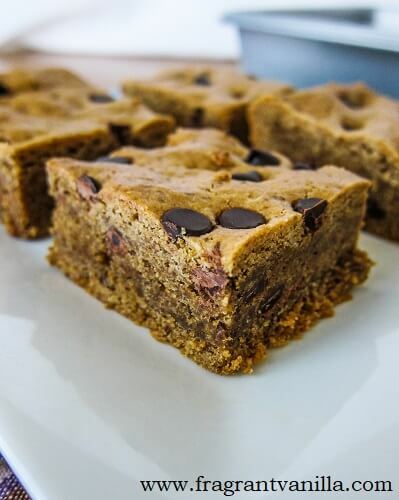 I think I actually like blondies better than cookies, because they are softer in the center and remind me more of cookie dough! If you are in the mood for something cookie like, but don't want to roll out cookies and all that jazz, give these a try! Blondies are just as amazing! Preheat your oven to 350F degrees. Line an 8x8 inch square pan with parchment and oil it. Mix in the vanilla extract and flax mixture until well combined. Add the baking soda and salt then the almond meal and flour, a cup at a time, mixing between each addition, until well combined. Mix in the chocolate chips. Spread the dough evenly into the prepared pan. Place in the oven and bake for about 30-35 minutes until starting to brown, and set in the center, but do not over bake. You want soft blondies. 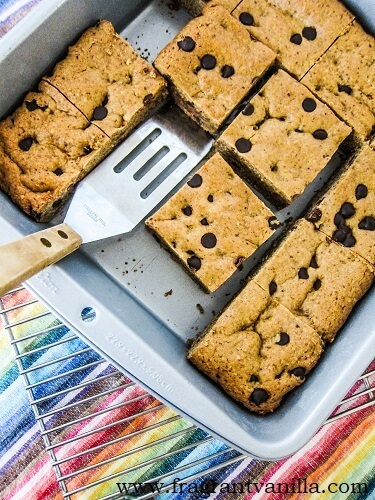 Remove from the oven and let cool, then cut into 16 bars and enjoy! These are the BEST paleo dessert ever. Made them twice already. My favorite chocolate fix! Awesome! Thank you :)! I am so happy to hear you enjoyed them!